I am also an E30 325is owner. Frankly, I'm amazed (though I must admit that I'm not sure I believe) that you could build an M20 (notwithstanding the fact that's it's a turbo) to put out enough HP to upstage your 911 and not blow apart in 10 seconds. [For all those who are not intimate with E30 325is BMWs - the M20 is a 2.5 liter12valve 6 cylinder which comes standard. It puts out 168hp and 164lbs in a car weighing approximately 300lbs less than a NB 993]. I see that you've enlarged the engine 2.7 liters (presumably with an eta or TD crank to achieve the extra displacement and lower compression). I imagine you are running a custom fuel injection system as it's unlikely the standard motronic can handle the fuel requirements of your car. Does the car have an intercooler? Glad to see you've done a 5 lug conversion (even though E30 M3 brakes are still mediocre). For me, the longer I own my 993 (it's been 9+ years now), the more I love it. 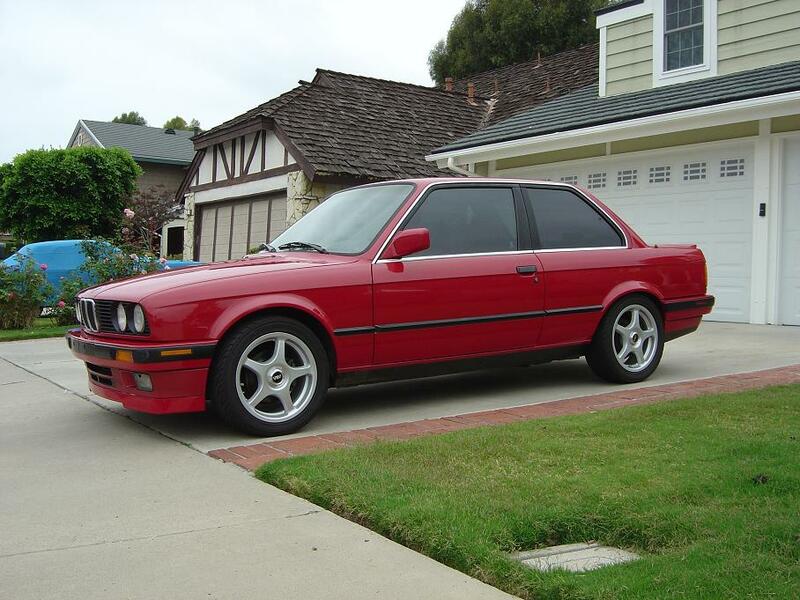 Same with my 325is, but to a lesser degree. I'll probably never sell either. I was amazed too when I first drove the car. Yes is does have the 524td crank, lightened and balanced. 2nd oversize super ETA pistons (forged by JE). The turbo kit is by Todd at www.turbochargingdynamics running 10psi. With a Begi RRAFPR the re-chipped Motronic does just fine and the AFR's are a safe 12/1 under boost. 30 pound injectors are installed. A car similar to mine runs mid 12's in the 1/4 at 110mph. It has a liquid to air intercooler with it's own tank and pump. The underpinnings are not stock either. E36M3 coilovers from Treehouse racing with Koni Adjustables, Urethane bushings throughout, bigger sways, and a UUC big brake kit with 13" rotors up front with 4 piston aluminum calipers. Also installed a quicker steering rack (2.7 turn lock-to-lock) out of a Z3. A friend of mine has a E30 M3. This car will destroy it. I initially wanted to build a 911SC to roughly 3.0RSR specs. I love those cars. Financially that was not possible, so I went with the E30 project. It's relatively cheap and lots of fun. I too love the RSR/IROC look. Someday I'm gonna take a 964 and backdate the looks to RSR/IROC. That way I get the 3.6 and the G50, and the upgraded brakes, suspension, and interior of the later car. Sounds like you've done your homework. Best thing about working with an M20is that unlike an S14, if it blows, it easy and cheap to buy another. These cars are lots of fun to tinker with. While my engine is stock (save a JC chip), I've done lots of suspension work - E30 M3 steering rack, E30 M3 springs, Koni adjustables (wish they made these for 993), alumium control arms with offset bushings, and most recently front camber plates and adjustable rear camber kit (this makes a huge difference). Next up - brakes. Already have steel lines, how do you like the uuc kit? I'm very happy with the brakes. I'm using the 750i master cylinder. I've got the stainless lines as well. Next up is removing the ABS pump and installing a bias adjuster. Nive looking E30 you've got there!